There are moments in life when u feel more cared for than you ever expected. When friends step up for you in the most thoughtful and unexpected ways. When you feel more loved than you ever thought you deserved. I feel so very thankful to recognize when I’m in the midst of one of those moments. In this moment, I want to thank our family, friends, and all the others who helped us on the road to recovery. Thanks for the warm messages, the delicious food, and the many miles of travel. But where did this all begin? What happened to Jordon? It’s hard to know where to begin when it comes to an accident. So I guess I’ll begin at my favorite part in the story – where some sort of divine intervention stepped in. You might call it a premonition, a coincidence, or a guardian angel. No matter what you call it, it saved Jordon’s life. But let me backup a minute. 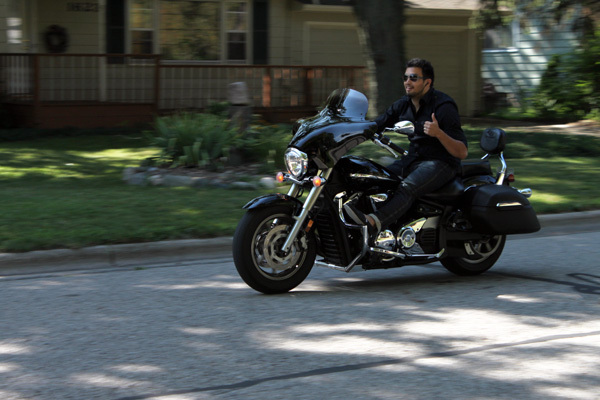 You may remember a few posts earlier, where Jordon was looking dashing on his motorcycle? I used these photos to describe my own last experience riding with him on the bike. But in truth, this was the day before his accident. You will notice that he was not wearing a helmet in these pictures and in fact, this is how he initially left my Mum’s house headed on a 2-hour trip to visit one of his best childhood friends, Brent. That’s right, he left the house without his helmet or riding jacket. But who could blame him? 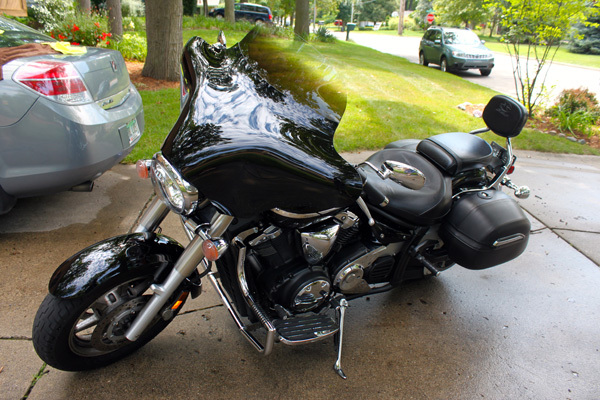 The weather was incredible and Michigan recently passed a no helmet law, allowing riders to legally ride without a helmet. But despite the law, Jordon often rides with his helmet and only occasionally enjoys riding without its constraints. He is a confident rider and never worries much about the dangers of the bike, knowing he can handle the challenges of the highway (and the drivers around him). The day before the accident, he left East Lansing feeling excited to catch up with Brent and visit his hometown of Muskegon. But as Jordon made his way onto the highway, he hit a tar snake (the quick-fix solution for repairing the cracks in the road). As the bike slipped ever so slightly, he envisioned himself falling off the bike and cracking his head open on the pavement. Like a watermelon bursting open to reveal its contents, he saw his life pass before his eyes. The vision shook him to his core and he immediately pulled the bike over at the first exit and called Gavin to bring his helmet and jacket. Without these two items, he would not have survived the accident the next morning. On the 9th, which was a Friday, Jordon headed back to East Lansing from Muskegon. The details of the accident are foggy, but we know he was close to the end of the journey when it happened. He remembers looking at the 73rd mile marker on the highway – thinking to himself “I only have 13 exits to go.” He was going the speed limit, but 70-mph is nothing to take lightly. The next thing he remembers is waking up in trauma ward screaming from the pain of 5 doctors working together to try and reattach his shoulder. Although he doesn’t remember, he had the wherewithal to give the EMT on the scene my Mum’s cell phone number and I appeared at the hospital as the ER doctors finished working on his injured shoulder. What we think happened, is that he had an epileptic seizure and blacked out. This will be the 3rd grand mal seizure that he has ever experienced in his life. It would solidify in his mind that he does have epilepsy and that the other two seizures (spread out over 4 years) were not just “flukes.” During his second seizure he was taking Kepra, leading him to believe that the medication did not work… or perhaps that it was not epilepsy at all. But after meeting with the neurologists in the hospital, he has resolved himself to the fact. It is a bitter pill to swallow for someone who hates to admit any weakness or disability. Over the next few days Jordon moved from Sparrow Hospital’s 1st floor emergency room, to the (new) neuro ward on the 10th floor, to the 6th floor rehab. 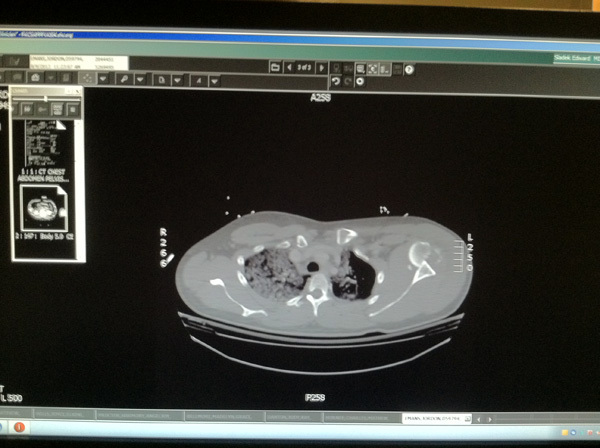 He had x-rays taken of his head, shoulder, foot, and stomach – along with an MRI and CAT scan. His breathing improved within the first few days (he had a lung contusion) and we constantly heard from the doctors how lucky he was to be alive. 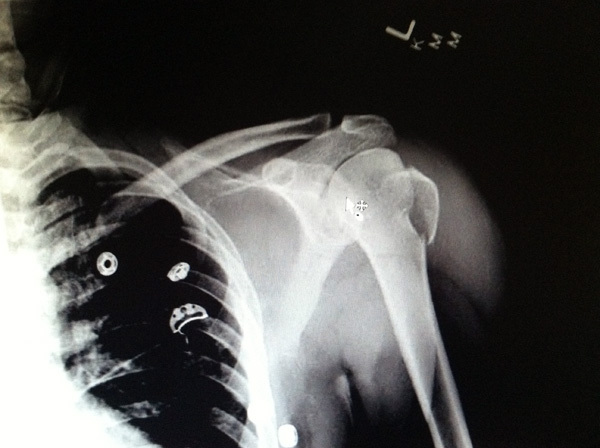 Four days after arriving in critical condition, Jordon had open reduction internal fixation (ORIF) of the left humerus. 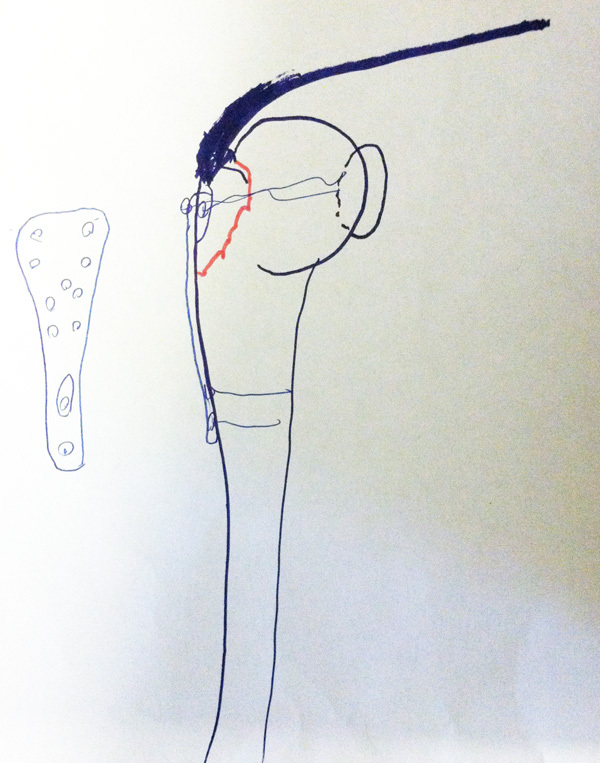 The surgery went smoothly and the surgeon drew me a picture of the procedure he completed on Jordon. What I wasn’t prepared for, was the amount of pain Jordon experienced after the surgery. Yes, post-op was pure torture for him and it took an hour and a half to get his pain under control. As you might imagine, seeing him writhing in pain was my own personal hell. It would take days… no weeks… before Jordon would be free of pain (to be honest, he’s not pain-free yet). But when it’s all said and done, Jordon received excellent care at Sparrow Hospital. 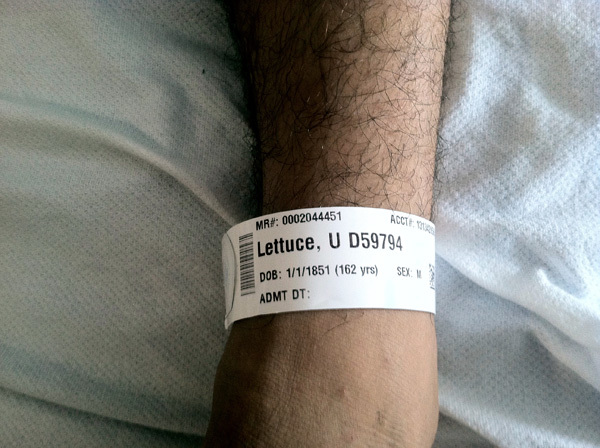 He ordered food from a custom menu, received lots of attention from doctors and nurses alike, and stayed in the comforts of a suite-style hospital room by himself (well, with me sleeping beside him on a pullout chair). By the 6th day he was itching to leave (literally and figuratively) and the most annoying part of the stay was the lengthy discharge process. 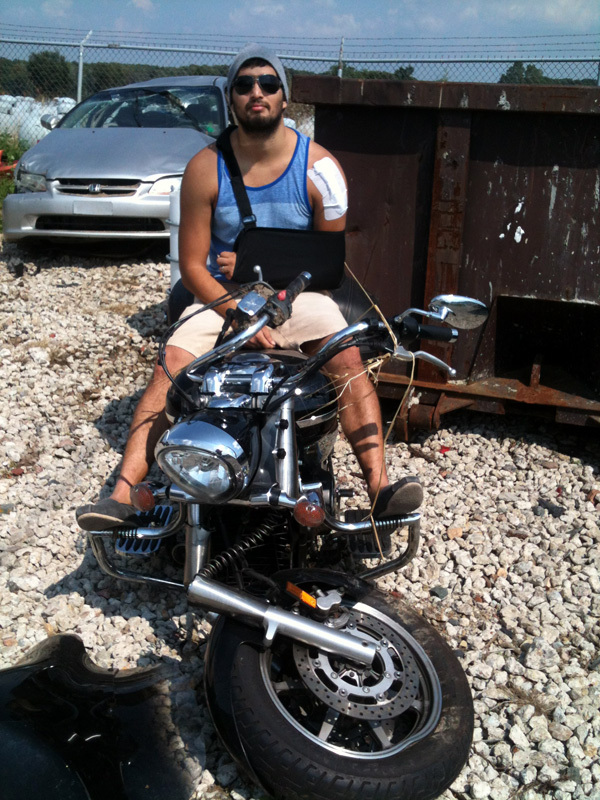 After being out of the hospital for a week, Jordon went and visited his mangled bike. As his motorcycle lay crumbled in a heap of strewn metal, a nearby bike only had a few scratches and dents. Jordon was told that the other person did not survive his accident. The reason? Because he was not wearing a helmet. The moral of the story is pretty obvious, but I’m thankful to say a helmet literally saved my husband’s life. For those of you who ride motorcycles, please never leave home without one. Life is unpredictable and I’m learning to cherish every precious moment. With love to our amazing friends and family! !